Copyriight Jenna Borst Photography (2018). KNOW BEFORE YOU BOOK: As a seasoned piper, I welcome you to preview my audio samples on GigSalad as well as my FOX17 interview (link above) so you know the quality of piper you're getting ahead of time. I have had the privilege of playing the bagpipes at a variety of memorials, parties and celebrations for numerous families and organizations. Please contact me to begin customizing the special experience you desire! Joe was a delight to work with in planning for my mom's memorial. Easy and clear communication and such a willingness to make sure the day was special. Even though it rained like crazy that day, the beautiful bagpipes were haunting and clear - everyone who attended had nothing but praise for the music. I highly recommend Joe for any event - he's professional, friendly and makes amazing music. I hired Joe to play the mother/son dance at my son's wedding, which was a surprise for my son, and it brought my son to tears! He was so surprised and Joe did such an amazing job! He brought the wedding guests to their feet and had them out on the dance floor for his encore performance. Both the bride and groom said it was the best part of their wedding day! Thank you so much, Maureen! Again, it was an absolute pleasure to play for the mother/son dance and your entire family. I've never received such an ovation at a wedding before! It was a great moment and a wonderful celebration. Congrats to you and your family on your son's marriage! My family hired Joe to play at my Pop's memorial service. The only thing he requested was that a piper play Amazing Grace at his service. We wanted to celebrate his life more than mourn his death, so we asked Joe to play a medley of Amazing Grace and Danny Boy (one of Pop's favorite songs) followed by a handfull of upbeat reels. Only the family knew that Joe was going to march in and play at the end of the service and it was just as incredible as we had imaged and there wasn't a dry eye in the church. Can't thank him enough or recommend him more highly! Thanks Joe, I know my Pop was smiling in heaven. Thank you, Sean, for the kind review. It was an absolute blessing and privilege to play for your Pop. The service was a great celebration of his life and it was amazing to hear how much he meant to so many people - even those he only knew briefly. Prayers and Blessings to you and your family! Joe Harmon played for a business function that the Michigan Realtors held in Grand Rapids, in the Imperial Ballroom at the Amway Grand. His performance was wonderful, and completely impressed our group of 160 members. Thanks, Joe, for raising our event to another level! Thank you, Theresa! It was an honor escorting in the senator and new board members. Even in the middle of a winter storm everyone showed up. What an event! The Best Wedding Decision We Ever Made! Joe was the absolute cherry on top to our wedding day. He is extraordinarily talented and is a true professional. He was such a surprise for our guests, he made my Scottish side of the family particularly emotional. From our first email conversation, Joe was professional, helpful and made sure that our big day would be everything that we had hoped. It was particularly special when he came down the aisle after our ceremony and escorted us out- a fun and emotional surprise that we will remember forever. Joe made our wedding day everything we would have hoped for, and we are forever grateful. Dad had long loved the sound of bagpipes playing. He had often said that's the kind of sendoff he would like. Contacted Joe on a Wed & he got right back with me & arranged his schedule to play on Fri morning. We had Amazing Grace as we said goodbye at the funeral home. Then Joe was gracious enough to be at the gravesite & played Danny Boy. I hadn't told any of the family I had hired him & they were just blown away! I'm sure Dad was smiling down on all of us. Thank you so much Joe for this beautiful sendoff. You were amazing! Thank you for the kinds words, Maria. It was an honor to play for your father. I had the chance to read his obituary after the service, and it was clear that he was one remarkable man. Peace and blessings to your family. Thanks again! 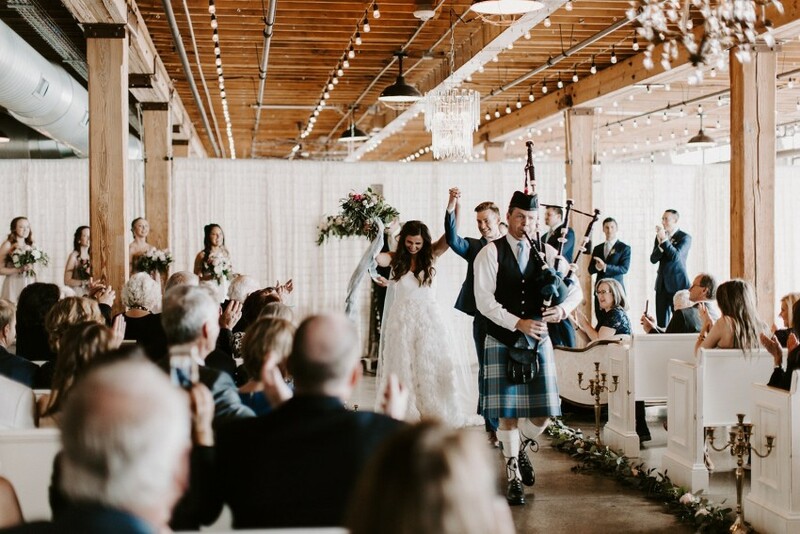 We had Joe do our daughters St Patrick's day wedding and besides doing a amazing job on the pipes he also was happy to help us out with some suggestions with music and choreographing. He definitely made sure we had the best experience ever! Thank you, Carol! There was nothing like kicking off St. Patrick's Day than a good ol' fashioned Irish Wedding. I hope the rest of the day was as fun as the morning. Slainte! Joe did a wonderful job! Seeing the bride and groom enter with Joe's accompaniment was the perfect touch to a beautiful reception. The day was so memorable, and I heard so many very positive comments about this special entrance. It meant so much to the bride and groom and their families. I highly recommend Joe to anyone who is considering a bagpiper to make their event very special. Thank you, Joe, for a touching performance at our memorial service for our mother. "Amazing Grace" echoed throughout the church as a tribute to our Grace. You were great to work with and kept in contact with me. I would highly recommend your bagpiping. Thank You for your kind message, Kathy. It was a beautiful memorial and an honor to help celebrate Grace's life. Joe did an amazing Job! Joe played at our small out door wedding. I appreciate his quick responses to all my emails. He was very helpful through out the whole process. On the day of the wedding his was on time and immaculately dressed. His performance was everything I hoped for and more. Thank you Joe! If you are looking for a piper, I would definitely recommend Joe! Thank you for your message, Dawn. Your wedding was beautiful and the setting was perfect. Congratulations again to you and Mark! Thank you very much for your wonderful piping at my Mother's funeral - an absolutely perfect ending to the service. Joe thank you for your honorable piping and my mothers funeral. A terrific send off for a phenomenal woman! Only a highly qualified and trained piper can deliver proper sound, expression, and execution of the bagpipe and melody. As a seasoned piper, Joe Harmon, has the ability to strike a moving and resonating chord in all those bidding a final farewell or celebrating a joyous occasion. Joe is able to help guide families through the process of when, where and what a piper should play. This ensures that you spend less time planning and more time focusing on what is most important – the celebration of a life. I am a native of Grand Rapids with strong Irish and Scottish roots. My Irish ancestors emigrated from County Wicklow, and my Scottish ancestors hailed from the MacDougall and MacMillan clans. 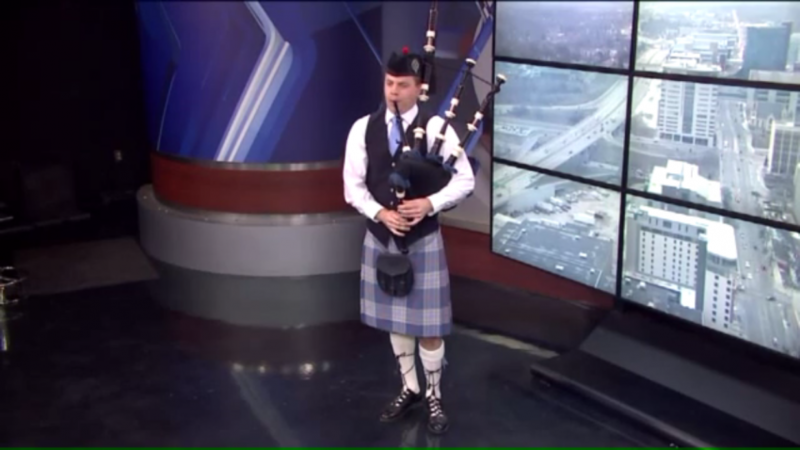 I started learning to play the bagpipes when I was 14 years old from a wonderful retired couple in West Michigan. They not only taught me to play at a high level, but with passion and purpose. I have competed in multiple solo and band competitions at the Grade III and II levels around the nation, including the U.S. Open and North American Pipe band Championships in Canada. I have also played at numerous weddings, funerals, charitable events, and parties. Why do I call myself the "Glendaloch Bagpiper"? Back in the late 90's I learned to play the bagpipes from the late Pipe Major Alan Wilson. It was Alan and his wife, Dorothy, that helped form the Glendaloch Pipe Band. Glendalough, pronounced Glendaloch, is a valley in Couny Wicklow, Ireland. It's name literally means "The glen between two lakes." Alan thought this was a perfect name for a Michigan pipe band since the state is surrounded by fresh water lakes. My five years spent with this band were some of the best times in my life. The band had numerous accomplishments including placements at the U.S. Open, North American Championships, and the Chicago Highland Games. I'm the Glendaloch Piper because I cherish the people and the band that made me the bagpiper I am today. I wear the traditional highland attire and bring my own bagpipes. I don't require much in setup, but having a separate area to double check my pipes is ideal. 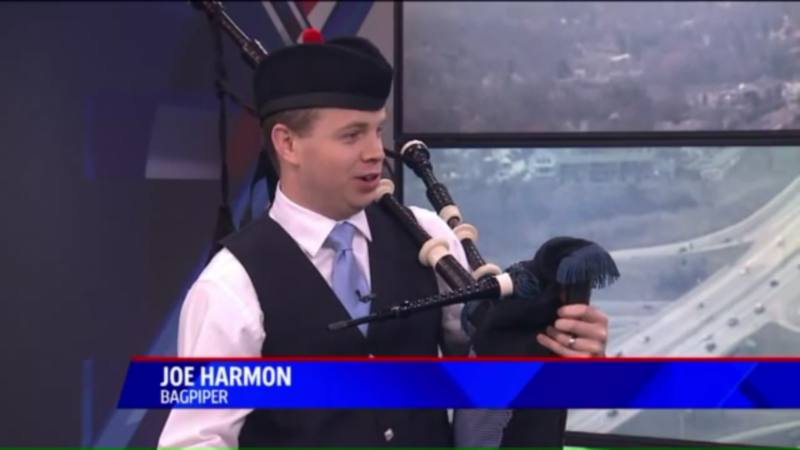 Many factors can impact the sound of a bagpipe including temperature and level of moisture. Having a separate area to take a couple of minutes to make sure the pipes are finely tuned will ensure the best sound. I have always been a fan of Celtic music. Altan and The Dubliners are my favorites when it comes to Traditional Irish music. Some of my biggest influences are former bagpipe instructors. Many of them played with the 78th Fraser Highlanders when they won the World Pipe Band Championships in Glasgow, Scotland.